Our 4-post shop press is super heavy-duty — up to 50 Ton Hydraulic Press — with options for 20 Ton and 30 Ton as well. Use this one for applications where perpendicularity and/or parallelism are imperative. Because the upper press reaction beam is infinitely adjustable, it can fit many unique job requirements. Also, the anvil can switch out with other styles. Infinitely Variable Height Adjustment — Each Post Independently. The 4 independent posts give maximum leveling and parallelism adjustment. Options for 20 Ton, 30 Ton and 50 Ton Press Capacity. Your Choice of Hydraulic Press Jack. Just insert the needed jack for fine press accuracy. Includes one anvil design, however, it is interchangeable with other custom options. Plans include complete blueprints and instructions. The 4-post 20 ton – 50 ton shop press is especially heavy duty with a design to help maintain perpendicularity and/or parallelism during pressing operations. 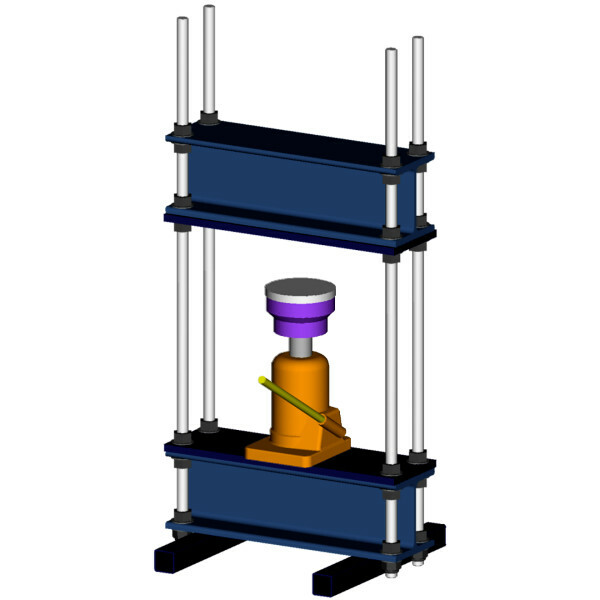 The 4 posts are independently and infinitely adjustable to meet a wide variety of size requirements while exactly locating the upper press reaction beam. This gives infinite options for whatever working height you need. Incidentally, if you find you need more height later, simply change out the 4 posts for longer ones. Design options include hydraulic press capacities of 20 tons, 30 tons, and up to a full 50 tons. A max of 100,000 lbs force! This is not a wimpy Chinese mail order tool. This design will take the full hydraulic press force without complaining. The anvil attaches directly to the hydraulic jack giving direct force application. Also, any number of anvil variations or attachments can easily substitute and meet the job or project requirement you have. Plans include easy to follow, fully illustrated instructions as well as engineering options for 20 Ton, 30 Ton and 50 Ton capacity. For more about the plans, please also see plans sample pages. Need something simpler? See our 2-Post Press! * Load capacity for the press is a static, vertical load central in the frame. The hydraulic press strength depends on choices for materials and components, as well as construction techniques, assembly methods and proper load application. Load capacity does not include strength of purchased parts such as the hydraulic jack. Build it well, then it will serve you well. Always Use Extreme Caution and Proper Safety Equipment When Pressing. Build It Yourself, And Make It Better! Looking for more? Check out these additional plans for Shop Tools including another press, gantry cranes and other lifting accessories.